@ZioRen wrote: Something is making me 90% sure that Rey is going to make a callback to Han's "take off that mask, you don't need it" line to Kylo in TFA and I'm so ready. Especially if it's in the context of "I've seen you, I know you, there's no hiding from me now." 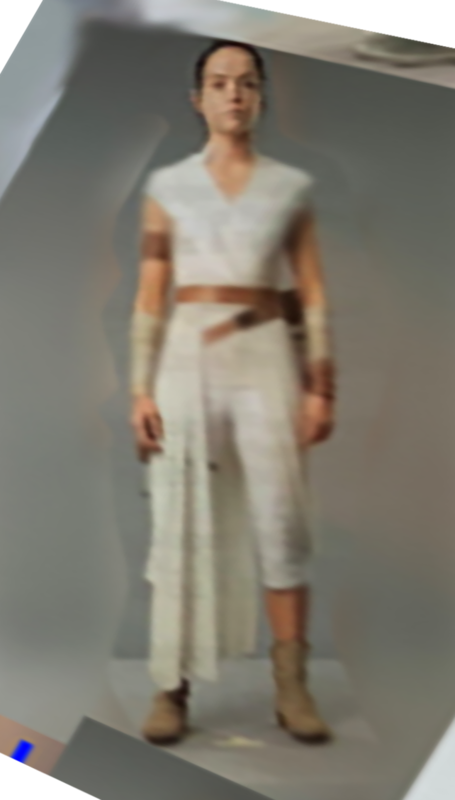 I love Rey's new costume.I think she'll probably get another one in the movie like she did with TLJ but I think the white one looks great and will look so good in contrast with Kylo in their scenes.The one thing I really don't like is the return of the TFA hairstyle.I know it's her iconic one and all but I never liked it even in TFA.I'm hoping it's not there the whole movie. The mask being back would be so worth it if Rey is the one that gets him to take it off again.And it really does sound like he won't be wearing it for long plus I like the symbolism of him glueing back the broken mask so I'm not disliking it like I did when we first heard about it. 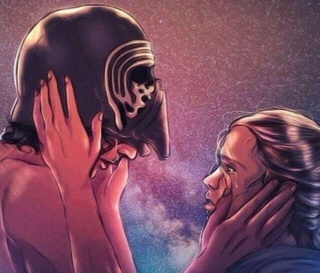 I'll always remember this fanart because Daisy liked it back when she was on Instagram. It was before TLJ came out too. I like Rey's new outfit as well, although the three buns being back is kind of disappointing. But if she's out in the desert, maybe she's wearing it out of practicality. Also, just a reminder that if Rey and Kylo do fight, it will probably be in the first or second act. I don’t think they are going to promote what happens in the third act of the movie. 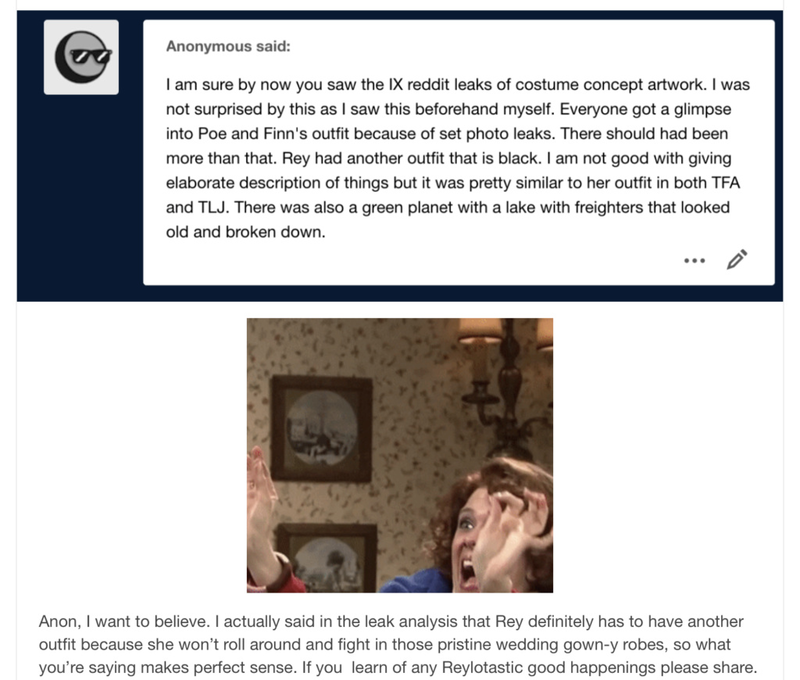 @bashfulblueeyes3 wrote: Also, just a reminder that if Rey and Kylo do fight, it will probably be in the first or second act. I don’t think they are going to promote what happens in the third act of the movie. 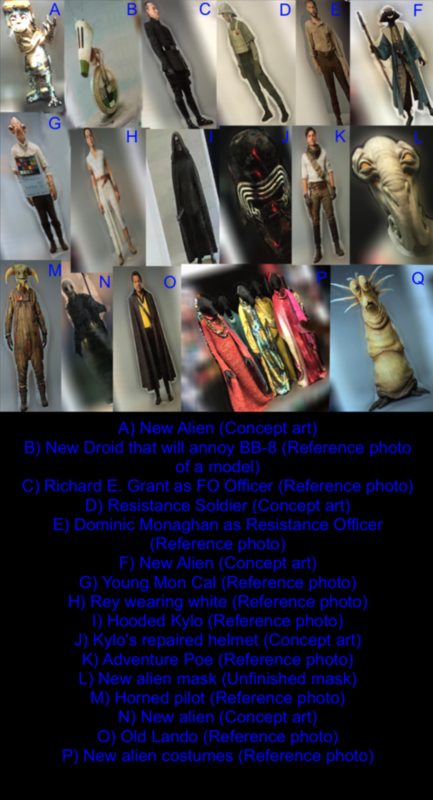 So it seems we are getting the first costume leaks!? Episode 9: So plot info was pretty much non-existent here. They only mentioned that it takes place about a year after TLJ. They talked about the culmination of the movie being a battle between Rey and Kylo. The did show a ton or artwork of planets and characters. The said Kylo has his helmet back and that it has been put back together with some kind of red adhesive. It looked kinda cool with the red lines going through it. They also talked about Rey's lightsaber and how it's back and has been reforged. They said the reforge is not shown on screen. There's a new droid. It's name is Dio and it's sort of a sidekick to BB8. It's little and has sort of a cone shaped head, kind of like a megaphone shape if you can picture it. Beyond that it was just a lot of artwork and toy packaging. They mentioned various new planet terrains but the only one I remember was some kind of Jungle planet. Ugh, I was hoping that this "Rey and Kylo's is the culmination" guy was wrong, because that could possibly mean 3rd Act Reylo. I don't believe for one second that Adam and Daisy won't share scenes together until the third act... They might have a battle in the third act but I bet they see each other a lot before that, probably through force bonds again but we will see. kylo with the hood is gorgeous, his helmet has something red, it looks like blood . I can not wait to see other images . Really loving these look, specially Kylo's. I am almost sure the mask is back only to sell toys but it looks cool too. Rey's a little boring I guess? But the contrast between them looks awesome. Hi guys! I wanted to remind you that we're not allowed to post leaked pictures here. We can, however, post links to them. Also hello to bride and groom imagery!! Legit or not it's interesting how much of it conforms to things fan discussions consider Fait accompli, like Richard E Grant playing an Imperial and annoying guy from Lost being the BFG's new pal. Lando in a cape, like does anybody think that won't happen? The outfits do look a little dull. It's back to the classy gas station look that Carrie roasted JJ about and prompted Kaplan upping his costume game, including space jewelry. - Rey and Kylo's costumes are definitely the "We both went back to what we were good at doing" I'd expect for the opening act. - It's not a coincidence Rey's outfit is similar to the AotC outfit. They've already said outright in the BTS doc for TFA how they reviewed and re-use scrapped designs from previous productions that are archived at Lucasfilm and Pinewood. The one difference is that being a poor she can't accessorize it with a pashmina. - Reverting to her original hairstyle is a curious choice. That detail emphasized how sad/pathetic her life on Jakku was by dressing to be recognized by people whose death and personal betrayal she'd blocked out as childhood trauma. Though that experience cemented her good girl coping behavior so it fits she'd go back to playing that role. - The patched-up mask and costume also fits for the opening act because he's acting out the villain (set identity quote from Kurosawa Kasdan always quotes, plus Rian's comments) he thinks he's supposed to be. And he can only force choke underlings for so long because his "let's take over the galaxy" plan depending on having Rey as back-up. He's on his own, so the mask is part of how he's trying to bluff his way through it. If they're going to continue with the theme in Solo of "there's always somebody higher up" and you have Grant playing an old Imperial, the costume is going to be part of his con. Otherwise if it's an actual leak, there's nothing terribly shocking here based on logical conclusions. And it's also definitely early stage costume for Kylo if they also continue with "too much of your father's heart...no Vader" themes that have been hammered home through three movies already. I would love to know what Carrie would think about how her last appearance as Leia is in the outfit she gave JJ so much crap about! ETA - the bit about Lando wearing an outfit similar to the one for him as a young man in Solo is interesting because that movie isn’t a standalone or prequel, it’s an addendum to the ST about Han which explains his arc in TFA, especially as a father. Lando is tied to that. Why is everyone guessing Rey has her 3 buns back? Are there any pictures besides this one from the leak? Could it not be just one single bun, like Padme? When the whole outfit is so similar to Padme´s in AOTC? @unicorn wrote: Why is everyone guessing Rey has her 3 buns back? Are there any pictures besides this one from the leak? Could it not be just one single bun, like Padme? When the whole outfit is so similar to Padme´s in AOTC? Yea, it doesn't look like three buns tied back to me...she somewhat has hair down her neck, so to me that would imply different style. The green planet: I wonder if that's the same jungle planet that the reddit leaker OP talked about in the same post from 2 months ago. If there is one leak I hope is genuine it's that Rey's sabre has a cracked crystal .....because she and Kylo truly would be opposite sides of the same coin then. About the return of the mask, I don't know if people here use to read fics, but it's interesting that in the fics post-TLJ, writers always write him with the mask (the main reason is that he doesn't fit the role of Supreme Leader, so he uses the mask to 'mask' his uneasiness). the NEW COSTUME OF KYLO REN !!!!! HAVE CHANGED SOMETHING but as always it's amazing!!!!! Now seeing better details his tunic looks more rounded towards the hips ? 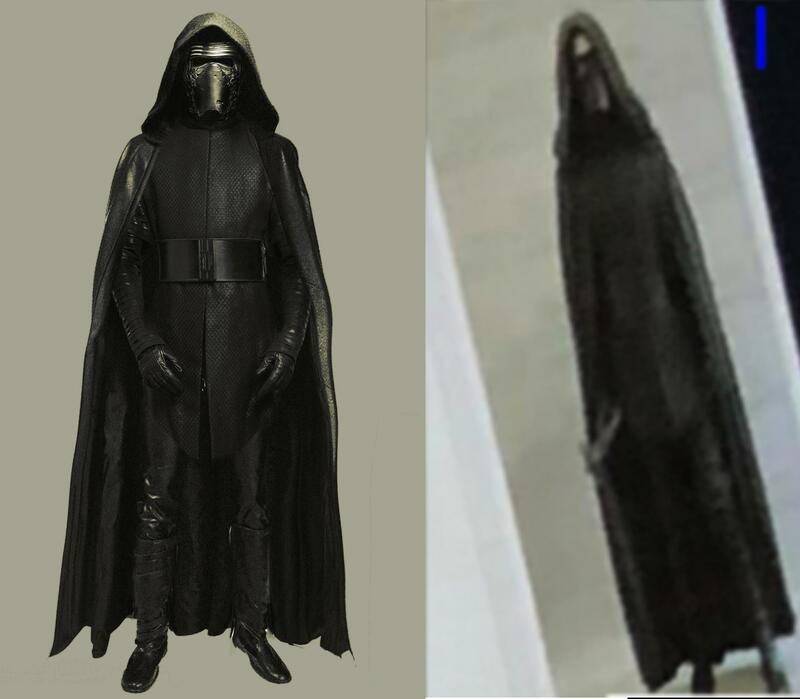 But maybe it’s just me some parts of it towards the hood and where the cloak meets the arms looks a bit Photoshopped ? hm, am I the only one disappointed by his "new costume"...? It looks like a mixture of his TFA & TLJ costume- nothing new or original. I doubt he's going to stay in one outfit the entire movie. Same for Rey. They never leak any third act stuff. Generally just first, maybe a little second act stuff.